Buying a swimming pool is supposed to be a dream and yet it is described as a nightmare process by so many new pool owners. Due diligence and buyer beware are great things to say but how do you actually differentiate the good from the bad? As a pool and spa expert and someone who has worked to develop an extensive knowledge of the industry I am continually shocked at the low level of knowledge that the average pool builder has. If you knew as much about pools and the pool industry as I do you would be absolutely terrified of the pool buying process. The average pool shopper is more likely to buy a lemon of a pool then they are to get a quality installation. Even if you are trying your absolute best to find the right builder you simply do not have the tools at your disposal to actually accomplish this task. There are too many ways to have the wool pulled over your eyes - too many ways for unscrupulous builders to get your money and provide you with something that looks like a pool (hopefully) but is actually something much less than what you have paid for. If you ask these questions you are going to absolutely, positively identify the guys flying by the seat of their pants. There is no way to fake actual experience and knowledge of industry standards. The average pool guy will be unable to answer most of these questions. Any pool professional that can answer most of these questions is far ahead of the average and should increase their stock dramatically in the selection process. 1) How do you calculate the volume of a pool? Asking this question will produce an audible groan from 90% of the pool builders you are interviewing. Why is this important? Well, I prefer a pool builder that is good with math and so should you. Sure everyone can just look up the answer and even many skilled and qualified technicians do not have this formula committed to memory - but some do. Good answer - Pool volume is calculated by multiplying the length, width and average depth, in feet, by 7.5 for rectangle pools or 7 for freeform pools to get the volume in gallons. Bad Answer - I don't know, I just look it up if I need to know it. Why are you asking me this? What is your problem fella? 2) How will you prevent the damage from galvanic corrosion in my pool? Jumping right into the deep end with this very technical question about something you should be very concerned about and your builder should be informed about. This question sets the tone for your pool installer interview as the vast majority of pool builders will not be able to explain this process. They would also be the same pool builder that would not be able to explain to you why your two year old heater has failed in the future. This question will identify the most well informed and technically proficient pool builders. Good answer - Galvanic corrosion is the process by which immersing dissimilar metals in salt water will produce a potential difference, or voltage, across metals in your pool. This process will corrode metals at an advanced rate and to reduce these effects the pool will be properly bonded, including all of the equipment, and a sacrificial anode system will be installed as a form of ongoing protection against stray currents. 3) How many pools have you built in your life? This is a loaded question and you are not necessarily looking for their actual answer here. You are giving this installer some rope to hang themselves with in your follow up to this question. When interviewing the "wrong" pool guy they will jump at this question after the last two and boast loudly about how many pools they have built. Which is great as your follow up question is to ask for 10 local pool build references of which you are going to randomly contact three for reference. A well established builder will be able to provide this and the fly by night companies will not return your calls after you ask them this. Good answer - I would be happy to do that for you. I have many happy clients in your area who you can speak with. Can I email you my reference list for your consideration? Bad answer - I have built 100's of pools but I do not have 10 references that I can provide. So, if I could just get that deposit from you...? 4) Other than chlorine name 5 things you measure/test for in pool water? There are many pool installers that are just construction workers that know the bare minimum about pools in order to put a pool kit together. This is not the kind of pool guy you want if you want to protect your investment. Having construction knowledge is obviously required however a well versed pool builder also understands the importance of pool care after the build and chemistry if the first thing a new pool owner is going to have questions about. See how many your pool installer can list for you off the top of their head. Good answer - In a pool you will need to monitor the total alkalinity, pH and calcium hardness primarily in addition to the chlorine level. Less commonly you may need to test for and correct copper, iron, manganese, phosphates, nitrates, CYA (cyanuric acid or stabilizer), and TDS (total dissolved solids) levels. Bad answer - I just build the pools I don't know about water chemistry. Can I use your bathroom? 5) Do you pressure test the plumbing for the pool after you install it? Another loaded question since even if they do not normally do this they will say yes to avoid looking like a hack. Your follow up question is more important, in that you want to know how many PSI they charge the system to and how long they will leave the test on before depressurizing. This is a fantastic question to qualify the quality of your installation - something that would be otherwise impossible for you as a perspective buyer to quantify. Most pool builders have little understanding of how to properly conduct a pressure test. Good answer - The maximum operating pressure for your pool system is 30 psi with a max rating of 50 psi for most equipment. This means pressure testing to at least this value is required to identify any potential problems. The lines are pressurized and are left for a minimum of 12 hours and even a drop of 1 psi means the line has failed the test. Bad answer - I charge up the pipe to 10 psi and watch the needle to see if it moves. If it doesn't move then it's good. 6) What ratio of sand to cement would you use to make the strongest concrete? Concrete is an integral part of building a quality swimming pool regardless of which kind of pool you are looking at, concrete, vinyl liner or fiberglass. There are a dozen ways where concrete skill and experience will effect the overall quality of your pool installation but how can you measure the concrete skill of your potential pool builder? This very basic question will show whether your builder has a fundamental understanding of concrete working or if they just get if off a truck and wheelbarrow it around. Good answer - If you are mixing only sand and cement together it is not called concrete, technically it is mortar or grout. The strongest mortar mix ratio is three parts sharp sand to one part portland cement. Bad answer - I just get mine in a bag from Home Depot. Say, that smells good! What are we having for dinner? 7) How much will a solar blanket heat up the pool water? Asking this question will help you to find out who knows what they are talking about and who is telling you what they think you want to hear. If your pool builder gives you the wrong answer to this question this should raise some red flags for you. Good answer - Solar blankets do not actually heat the water. They help to limit heat loss that you experience from cross winds and from large differences between the pool water and ambient air temperature like experienced at night. Bad answer - Um, about 5-10 degrees. You want a solar blanket? That's extra. 8) Does salt water take less time to maintain than chlorine pools? Still to this day one of the biggest problems with salt water chlorine generators is the mis-information that dealers use to sell these products to unsuspecting customers. Salt pools can have some advantages depending on what benefits you are looking for, but salt water pools ARE NOT maintenance free. They are just a different method of supplying chemical sanitizer, the same as any other form of chlorination, and you must still adjust and balance all chemicals in your pool. Good answer - Salt chlorine pools do not take less time to maintain since everything you need to monitor in a traditional chlorine pool still applies to salt water pools. There are some conveniences such as not having to deal with concentrated chlorine however a salt pool will have a learning curve for how you will maintain your other chemical levels. It may be a little different then the maintenance schedule you are used to at first but in the long run salt water pools can take minimal time to maintain. Bad answer - Salt chlorine pools are maintenance free and basically do not take any work at all. If you want one I can get you a good deal on one. 9) What are phosphates and what do they do in pool water? While not every pool builder is also a chemical expert there are some basic things that any reputable pool professional should know. If you encounter difficult to resolve problems in your pool it is better for you if your pool installer also has advanced knowledge of problems that you can encounter. Phosphates are a relatively complex problem that you are unlikely to find someone that can explain in depth but a basic understanding shows that your pool installer is aware of common industry problems. Good answer - Phosphates are what algae eats and requires to multiply - like an all you can eat buffet for algae resulting in rampant growth. If you have phosphate levels anywhere higher than a few hundred parts per billion you will use chlorine at an advanced rate and may be unable to control algae growth in the water despite having measurable chlorine levels. Phosphates are found commonly in detergents, fertilizers, rural water sources & wells and some commonly used pool and spa chemicals such as many scale reducing products. Anything over 1000 ppb requires corrective action to be taken. Bad answer - I'm not sure...I think they make the water more fossfurry. You should buy a cartridge filter. 10) What strength, thickness and reinforcing will you use for my pool deck? Many pool builders do not like to include the concrete decking with the pool installation as this requires a fair bit of experience and technical skill to do well. The larger the open areas of concrete you want, the more skill it will take to finish the concrete properly. 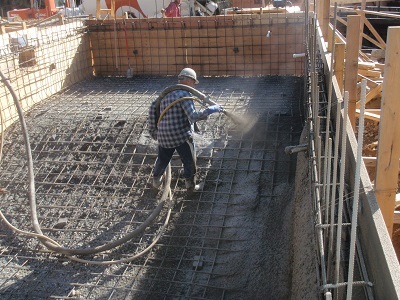 Subcontracting of the pool deck to a third party is very common so you want to find out exactly who is doing the deck, how it is being done, and where the onus of liability will fall in the event that the deck does not go in well or shows signs of early failure like extensive cracking during the 28 days following placement. Bad answer - I know a guy named Tony and he will give you a great deal on your concrete deck. Worst answer - No idea, I just build the pool. Look, I will give you a discount if you pay with cash OK? BONUS) I have a pool party next Friday - Is the pool going to be ready by then? Keep a straight face when you ask this important question and watch carefully as your potential pool installer turns purple. Referencing your upcoming pool party is the trademark slogan for problem customers in the pool industry. This question will serve no purpose other than to entertain you, you sick monkey, and to gauge the sense of humor of the guy you are going to give tens of thousands of dollars to. Good answer - It is important to understand that while we will make every effort to complete your project as outlined in our estimate there are certain factors, such as weather, which are not within our control. We will be sure to keep the communication lines open with you throughout the project in regards to anticipated completion dates however I can not guarantee that you will be ready to swim by next weekend. I would like to manage your expectations by advising you to consider rescheduling your party to a future date to err on the side of caution. Bad answer - Ya sure, no problem. I absolutely, positively guarantee that the pool will be built, filled, heated and balanced by next Friday. Worst answer - Oh blow it out your return line! 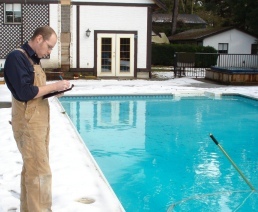 You should not expect your pool installer to be able to answer all of these questions in explicit detail however you should expect your potential pool installer to demonstrate at least a reasonable understanding of these areas. Most of all the unskilled, or marginally skilled, pool installers will be completely lost in this nightmare questionnaire and by thinning the herd this way you dramatically increase your odds of getting a quality pool install by a quality installer. Are you planning to get a new pool? Read this E-book from Steve: How to get the most value with a new pool installation.